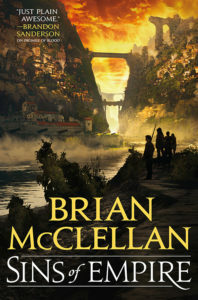 Brian McClellan’s Powder Mage trilogy is one of my favorite new fantasy series’, and I’ve been looking forward to the new trilogy set in the same world ever since Brian talked about it in my interview with him a couple of years ago. And now it’s finally out, and I’ve read it, and I thought it was even better than the first trilogy! The new country of Fatrasta is ruled with an iron fist by the Lady Chancellor Lindet. Her secret police, the Blackhats, are almost everywhere, and where intimidation and arrests won’t work, there are mercenary companies. The famed powder mage Vlora leads one of these companies, and is suddenly called back from the frontier to deal with an insurgency within the capital city of Landfall. Of course, the insurgency isn’t as simple as it seems, and the long isolated Dynize Empire appears to be stirring again. It’s up to Vlora, her Blackhat liaison Michel Bravis, and disgraced Fatrastan war hero Ben Styke to figure out what exactly is going on and what it means for Fatrasta. I love the flintlock fantasy subgenre in general, and the world of these books in particular. The gunpowder based magic system is one of the coolest ideas that recent fantasy has produced – I’m not sure why I love it so much, but it probably has something to do with why I also love Westerns and cheesy action movies. Anyway, there are guns, there are printing presses and penny dreadfuls, there’s exploration of colonialism without making anyone the bad guy. The world seems like it’s vibrant and changing quickly, and it really jumps off the page. The pacing is probably the weakest point of the book, but I’d only call it weak if I was trying really hard to find something negative to say. For the first half of the book, I had no idea what was going on or what the ultimate plot of the book was going to be, but once things started falling into place, the revelations kept coming. My only major complaint is that I want to find out what happens next, and I don’t know when the next book is coming out.